Dangerous. That’s one word for this antipasto flatbread pizza. I can’t be trusted around it. Everything good is on each and every slice. I could’ve used the same toppings on a ‘regular’ pizza crust, but we prefer flatbread pizzas. Crunchier. Lower in carbs (so I can eat more). And well, kind of fun to eat. They also make for great appetizers. Big honkin’ slices of thick crust pizza aren’t the best appetizers. There’s no real sauce on this antipasto flatbread pizza. But, it is definitely not dry. Go crazy with the toppings, but if you do use lots of ‘wet’ ingredients, like marinated peppers or olives, drain them a bit before putting them onto the pizza. 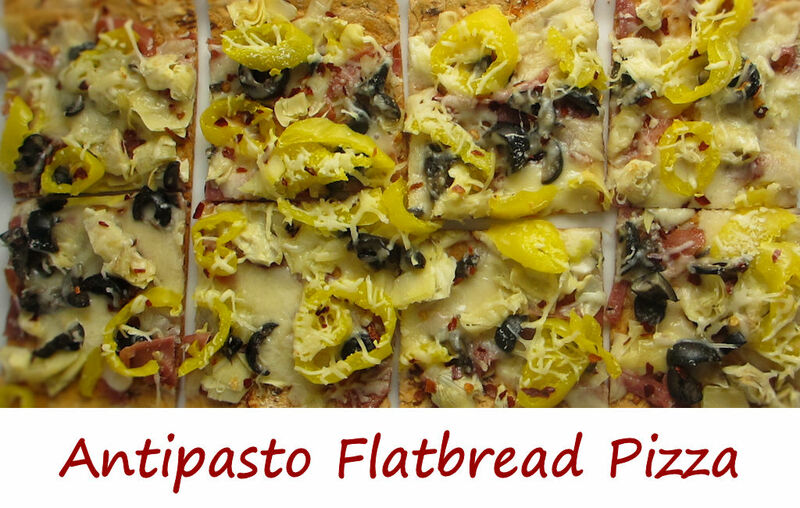 Flatbread can get soggy if you overload it with sauce or moist toppings. Also try my grilled chicken flatbread pizza. Oh my goodness. 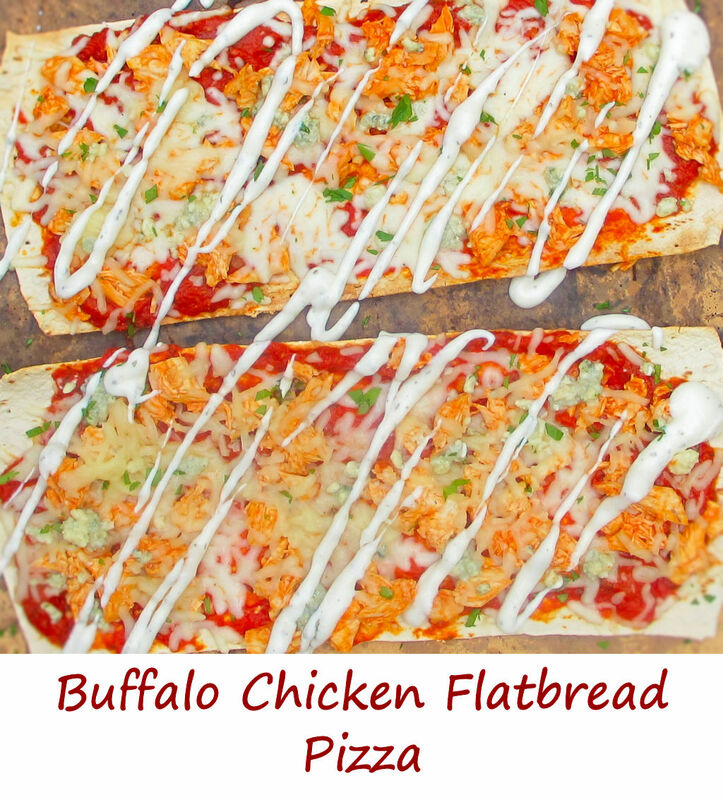 I was so happy with these Buffalo chicken flatbread pizzas. Fantastic flavors all around, from the spicy chicken to the tangy cheese to the creamy Ranch and fresh cilantro. 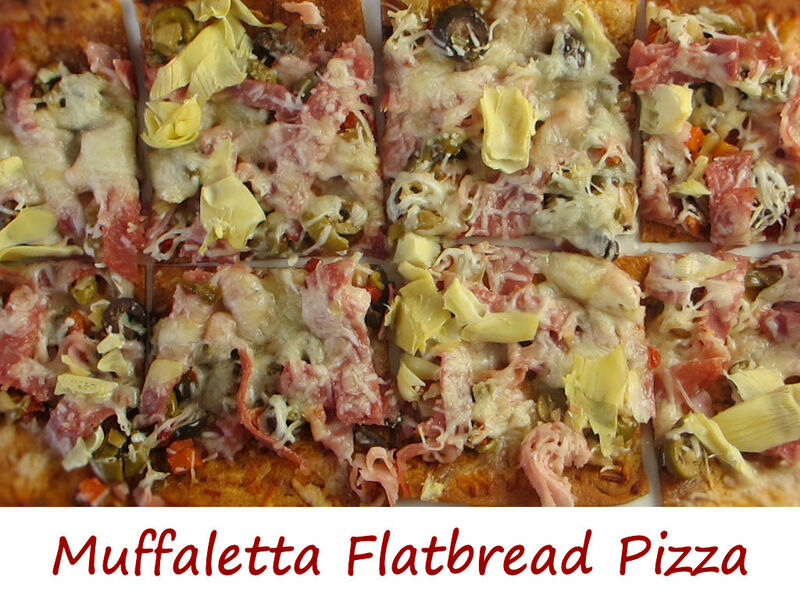 All served on low-carb flatbread pizza crusts that take only a few minutes to bake. It really doesn’t get any easier than these pizzas. Thin flatbread pizza crusts are quickly becoming a staple in our home. I keep homemade pizza sauce on hand in the freezer, so I can whip together a quick dinner by just adding some cooked sausage or chicken or whatever I have on hand. They’re also a great way to use up leftovers, from tomato slices to turkey. You can leave off the blue cheese crumbles and Ranch dressing and instead drizzle these pizzas with blue cheese salad dressing. Place pizza crusts on baking sheets and bake for 2-3 minutes. Remove. Spread pizza sauce out evenly onto the crusts. Sprinkle with chicken, mozzarella and blue cheese crumbles. Bake for 4-5 minutes or until mozzarella has melted. Drizzle with Ranch dressing and garnish with cilantro. Cut each crust into 4 slices and serve.